Admin: Office hours M 3-4pm, F 2-3 pm. Our course TA and coding coach is Jon Brown, who runs the X-hour 3pm Wed.
Introduction to Matlab: Oct 8 4-6pm. Berry Instructional Center, Carson Hall. Programming With Matlab: Oct 16 4-6pm, Berry Instructional Center, Carson Hall. Week 1: Overview linear PDEs. Linear systems, norms, singular value decomposition. [NLA] Ch. 1-5.
vandermonde: shows numerical rank of said matrix which we proved was full rank. Week 3: Quadrature, convergence rate given by nearest singularity, error bounds and proving convergence [NA] Ch. 9.1-3. Jon's X-hour codes: intsp, fib2, matrixfill, sp. Week 4: Periodic quadrature [NA] Ch. 8.2, 9.4. Integral Equations, Nystrom method. [Atkinson] Ch 1.1.-1.3, [NA] Ch. 12.3. Code for HW4 #3 c, which people struggled with: hw4ans3c_nystrom_interpolation. Please read this through (it's short). Worksheets: laplace (Greens identities and checking the fundamental solution). Code for HW6 #2,3: dlp_bvp_simple. Note the use of vectorization to fill Nystrom matrix with no loops. Week 7: Helmholtz scattering problems. Avoiding interior resonances: Brakhage-Werner-Leis-Panich method. [CK]. Dirichlet eigenvalues of domains, Method of Particular Solutions. Week 8: Error analysis of MPS. [Still, Barnett, Betcke papers] Minimax characterization of eigenvalues, Weyl's law (theorem) for eigenvalue counting asymptotics [GAR] Ch. 11. Week 9: Low-rank approximation of kernels, Fast Multipole Method. In-class project presentations. 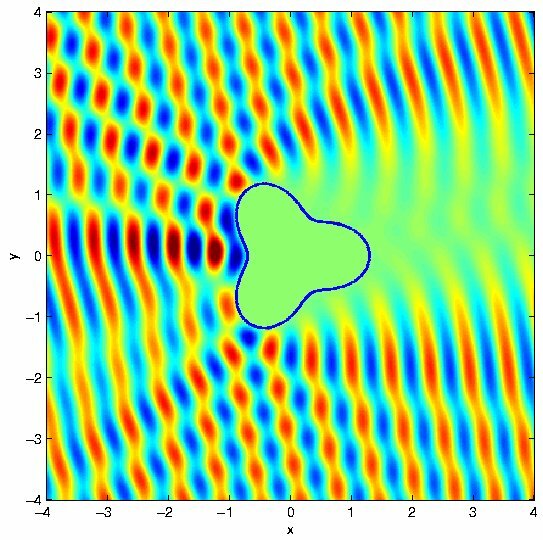 Code for low-rank demonstration of 2D Laplace kernel: lowrank. Zaven Ovanesyan: 1, 2, 3, 4 (written part), 5, 6. Project topic ideas list. Final writeups due 9am Wed Dec 10. Course grades based on 60% HW, 40% project.